Image caption The watercolours were found in albums within a dusty accordion file. Reproduced courtesy of the Princeton University Library, Manuscripts Division. 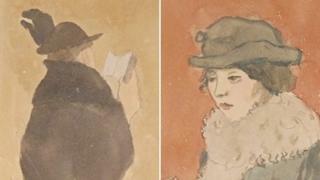 A collection of paintings by a renowned Welsh artist has been discovered gathering dust in an American college. The 23 unsigned watercolours by Pembrokeshire-born Gwen John were identified at Princeton University by a British-based art expert. Prof Anna Gruetzner Robins, of Reading University, found the works among papers bequeathed to Princeton by Milford Haven-born poet Arthur Symons. Prof Robins estimated their worth at £500,000. Gwen John, who died in France in 1939, was often overshadowed by her brother Augustus but has been more recently regarded critically as a superior artist. Prof Robins explained that she was working last year at the university in New Jersey as a senior research fellow when she discovered the collection "by pure chance". "It was down to serendipity," she said. "I had finished working on my research into something quite different and thought I should make the most of the time I had left." Deciding to take a look at papers belonging to Arthur Symons, a highly-regarded symbolist poet and a correspondent with Irish poet WB Yeats, she noticed on a computer entry that they included a quantity of unknown watercolours. "When I requested the files they produced a dusty box containing an accordion file, and in this were two albums," she said. "They were also very dusty and clearly hadn't been looked at for a long time. "I opened them up and was amazed." Prof Robins said her first reaction was to go to the librarian on the desk and tell him she thought it absurd that the university library had 23 Gwen John watercolours that it clearly knew nothing about. "He said: 'There's was a complaints form over there. If you are unhappy with the library you should make a complaint'." After some research Prof Robins realised the true significance of her discovery. "It turned out that these watercolours were very significant," she explained. "Not only were they great quality, but [Gwen John] rarely exhibited her work during her lifetime. So the fact that she had selected these watercolours and put them into albums for someone she admired is important." After researching the artist's friendship with Symons, Prof Robins discovered that she had given these albums to him in June 1920, shortly after he had returned from meeting her in Paris. This also was significant. "It was the first time we had had a date," she said. "She never put a date on anything of hers." Asked to describe Gwen John's importance as an artist, Prof Robins replied: "Many people think she is simply one of the best. "She is a real painter's painter. She was an absolutely superb technician. She worked incredibly hard at her painting. "When you look at these watercolours you can see her every mark, and that every one was carefully thought out before she put it down." Don Skemer, curator of manuscripts in the department of rare books and special collections at Princeton University Library, said many of the discovered watercolours depict nuns, women parishioners and orphaned girls in the Catholic church at Meudon, the Paris suburb where John lived for nearly 30 years. "Almost all of these subjects are viewed from the back," he said. "Other water­col­ours in the album por­tray a woman in a train car­riage, a woman wear­ing a strik­ing boa, and a black cat in a win­dow. A few of the water­col­ours have pen­cil sketches on the reverse." Symons' papers, including the watercolours, were bequeathed to Princeton in 1951 by American painter and art collector AE Gallatin, who acquired them from Arthur Symons' widow. The watercolours are on display at Princeton until 31 December.